The washing stage is all important and the traditional sponge and soapy water rinse is a definite no no. Sponges love to hold onto grit and grime as you run them over the surface of your car. Most damage frequently seen on paintwork, such as swirl marks, light scratches and cobwebbing, occurs during the wash stage. 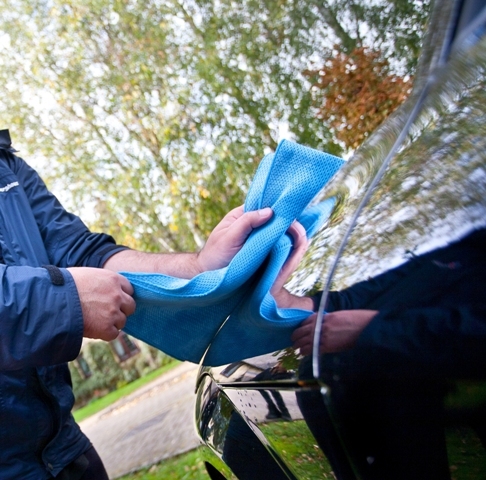 To help minimize damage, a prewash is highly recommended. Rinsing your car before you wash will remove the worst of surface contaminants like dirt, road salts, fly impacts and dust. Go over your vehicle with a hose or pressure washer, paying particular attention to the dirtiest areas – wheel arches, behind the wheels and lower sills. For heavy build-ups, a pre-wash foam can be considered. This is applied to vehicles using a foam gun or lance attachment for your pressure washer or hose. 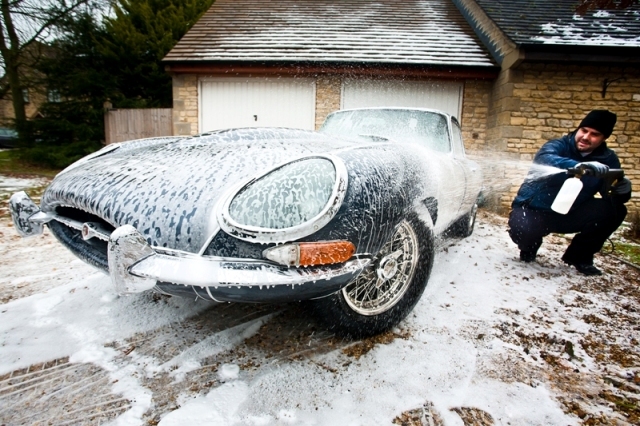 It fires a thick foam blanket over your car that is then left for several minutes to work its magic, prior to rinsing it off. 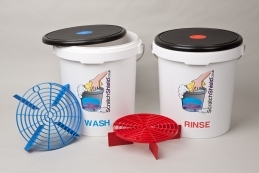 Manufacturers claim that the modern cleaning agents in the foam dissolve and suspend dirt particles, safely removing the bulk of damaging contaminants prior to hand washing. After the prewash, it’s time to get hands-on. Opt for a mild, good quality shampoo that suits your requirements and follow the manufacturer’s dilution ratios. Some shampoos do more than just clean. Scholl Concepts ShamPol, for example, adds a layer of protection and has self-drying qualities. At this point, professional detailers will advise that you ditch your sponge and invest in a quality wash mitt instead. A soft lambswool version is the pros’ choice as the deep, loose pile draws dirt in, away from the vulnerable paint surface, but is easily rinsed out. Start with your wheels, which deserve to be treated with the same amount of respect as your paintwork. Ensure wheel brushes aren’t too hard, and have soft tips. Invest in a good microfibre wash mitt, which is harder wearing and more suited than lambswool for the ins and outs of wheels. If brake dust is an issue, have a good oxalic acid free wheel cleaner to hand. Angelwax Superior Wheel Cleaner is a low cost, safe and acid free option. PureX Wheels is an everyday wheel cleaner that cleans, seals and protects in one. 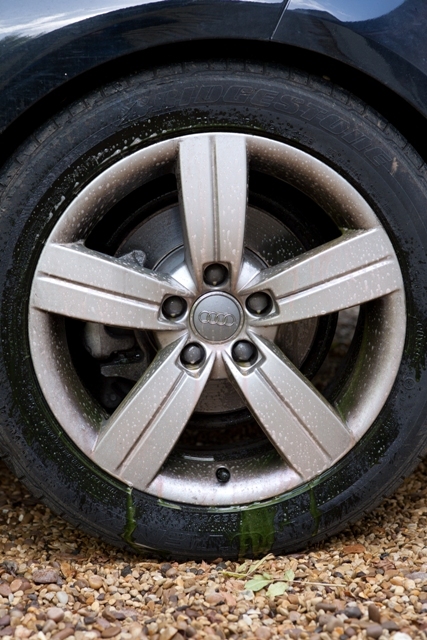 Just spray on, agitate with a brush (a paint brush will do, but apply low tack tape around the metal edge to avoid it damaging wheel rims), then rinse off after several minutes. To shift more stubborn brake dust build ups, try a concentrate, non abrasive cleaner like Restore or Rim-7. Suitable for most wheel types, again this is best applied by brush, working it in all the nooks and crannies. Patience is advised with wheels. Don’t be tempted to scrub. It may take more than one application to get your desired result, but have faith in the products you use. Give them time to work and follow manufacturer’s application instructions carefully. Next, degrease and clean your wheel arches, but don’t scrub them if they’re painted – just spray and rinse. Tyres too can be degreased. This will help remove build ups of previously used products and will ensure good adherence of tyre dressings. General purpose cleaner SP Wonderspray is an ideal degreaser or use similar all purpose automotive cleaners/traffic film removers. After rinsing, drying is recommended in order to avoid water spots forming. Although the surface is now clean, care still needs to be taken not to damage paint during this process. Modern microfibre drying towels, like Spautopia’s Valeting Towel, have distinct advantages over traditional chamois leathers. They are soft, have no rough edges, offer extreme absorbency and can be washed in a mild detergent and reused time after time. Pat the cloth on the surface (don’t rub) and keep an eye out for dust or any other rogue contaminants that may drop on the surface after washing. At this stage you may still see marks left by bug impacts and bird droppings, tar spots and other such contaminates. These can easily be removed with the help of a clay bar.